There is little so universal as singing. Singing in groups exists around the world and can be traced back all the way to Ancient Greece. “Every culture sings, it’s a worldwide language,” says Wenke Minne who manages Singing Brussels, an initiative by arts centre Bozar. It’s only one of many: the Belgian capital is home to dozens of choirs in all shapes and forms. The EU Choir is living proof of that: as one of Brussels’ oldest international choirs it’s celebrating its 60th birthday this year with more than 80 members from 22 countries. “We want to transmit the European message via singing,” says De Moor. For its anniversary concert in March, the singers performed Beethoven’s 9th symphony, religiously rehearsing every week in the beautiful chapel of the former Royal Military School. The choir also works with professional structures such as the National Orchestra and La Monnaie. 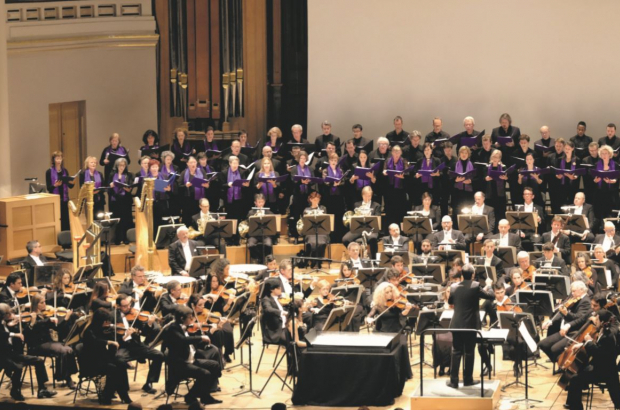 To ensure a certain level of excellence, the EU Choir requires interested singers to audition, as does the Brussels Choral Society, an ambitious international amateur choir that has sung at high-profile events such as a Belgian royal wedding and at London’s Royal Albert Hall. “If you’ve never sung before, this is probably not right for you. But if you know how to read sheet music and have sung in a college or church choir, don’t be afraid to audition,” says Levke King, president of the diverse group, which brings together 108 music lovers aged between 30 and 80 from 21 countries. “I love working with them because of their dedication – they all make a big effort, practise at home and are eager to explore their passion,” adds Eric Delson, their American conductor. For those who prefer a less demanding singalong, the Brussels International Singers might be a good option; it’s a choir that’s open to everyone. “My goal is to find a balance between serious work and a fun atmosphere,” says conductor Philippe Lambert. “Even those who can’t read musical scores are able to join. We have recordings of the songs for people to practise at home.” Nevertheless, quality remains high: the troupe regularly plays with musicians from La Monnaie, and prepares a Christmas and spring concert each year. If you’re not up for a regular commitment, then there’s always Singing Brussels, an initiative aimed at uniting citizens from all walks of life, transcending generations, genres and ethnic, cultural and religious borders. The free singing workshops are led by Paul Smith, known for his unique and playful teaching methods that don’t require any musical experience. "the free singing workshops are led by Paul Smith, ..."
Where are when? I'm interested.